More than 4,300 Medicaid expansion enrollees in Arkansas will lose coverage for the rest of this year because they did not comply for three straight months with the state's first-in-the-nation work and reporting requirements, state officials announced Wednesday. The low-income Arkansas adults losing benefits this month were among 27,140 people ages 30-49 notified in May that they were subject to the requirement that they file a report that they spent 80 hours a month working, volunteering, going to school, or receiving job training. Nearly 260,000 people are enrolled in Arkansas' Medicaid expansion program, called Arkansas Works, which has helped cut the state's uninsured rate nearly in half. Beneficiaries must report that they were either meeting the requirement or that they qualified for an exemption, such as a disability, through an online portal run by the state Department of Human Services. There is no option for reporting by phone, mail, or in person. The work and community engagement requirements will be extended in January to people from ages 19 to 29. Thousands more Arkansans will be at risk of losing their Medicaid benefits next month if they have not complied with the requirements. Meanwhile, U.S. District Court Judge James Boasberg in Washington, who is hearing two legal challenges to the new work requirement rules in Arkansas and Kentucky, on Wednesday denied a Justice Department motion to consider the Arkansas suit as an unrelated case. That means Boasberg, who already has blocked the Kentucky work requirement, will also handle the Arkansas lawsuit. The Justice Department declined to comment on his decision. Some experts estimate that as many as four million Americans could lose Medicaid coverage if work requirements are applied broadly. 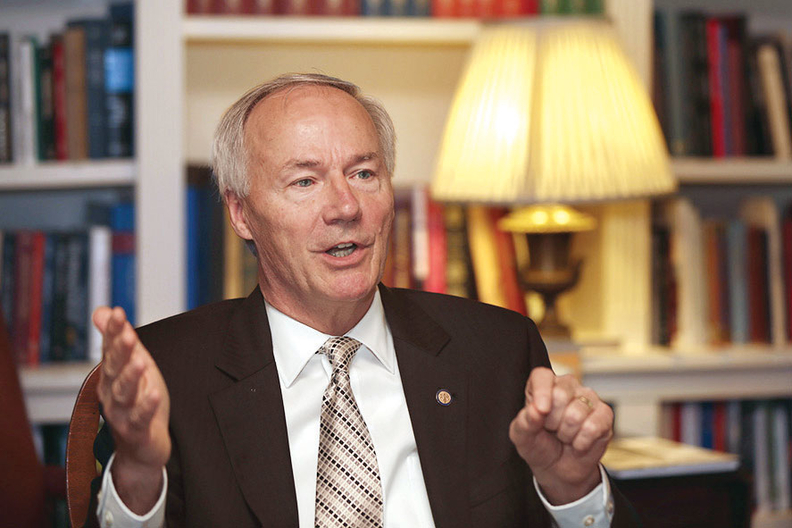 At a news conference Wednesday, Arkansas' Republican Gov. Asa Hutchinson said he would like to see fewer people losing Medicaid benefits under the new program. But he said the state worked hard to help beneficiaries comply, and that nearly 1,000 people gained job training or employment as a result of the program. He added that dropping the 4,353 people from Medicaid would save taxpayers nearly $30 million in a year in Medicaid managed care premiums. "These people could have found other coverage, or it could be they moved out of the state, or it could be they simply don't want to be part of the workforce," Hutchinson said. Asked by a reporter about a woman who says she says she was in the middle of treatment for a breast tumor and who now has lost Medicaid coverage, Hutchinson said he would want to hear more details about that case. Arkansas is one of four Republican-led states, including Kentucky, Indiana, and New Hampshire, that received the CMS approval earlier this year for a five-year demonstration waiver to establish a so-called community engagement requirement for Medicaid beneficiaries. At least nine other states want to establish a similar Section 1115 waiver requirement. The Trump administration in January encouraged states to seek work requirement waivers. Advocacy groups have sued to block the Arkansas and Kentucky work requirement waivers, using similar arguments in both cases. Judge Boasberg halted the Kentucky program in June on the grounds that the HHS secretary did not adequately consider how the waiver would affect health coverage—the central purpose of the Medicaid statute—before approving the changes. The CMS held a new public comment period that closed last month, and hopes to restart the Kentucky program soon. No hearings have been held yet in the Arkansas suit, also filed in federal court in Washington. The state of Arkansas has filed a motion to intervene. The Trump administration and GOP state elected officials say the work and community-engagement mandate will improve the health and wellbeing of beneficiaries and help transition them to private health insurance. "The goal is to increase labor participation and increase worker training and assistance to able-bodied people who want to work," Hutchinson said Wednesday. "This pulls them in that direction. There is a great deal of success stories, and we want to increase that." But Democrats, provider groups, and many policy experts say it will significantly reduce coverage, drive up uncompensated care, and make people less employable by taking away their healthcare. "We are very concerned about people losing health insurance due to lack of knowledge of the work requirement and problems in reporting," said Bo Ryall, CEO of the Arkansas Hospital Association, who worried about the 5,000 people who have been non-compliant for two months and are at risk of losing coverage next month. "We would like to see that lawsuit be successful and stay implementation of the work requirement." 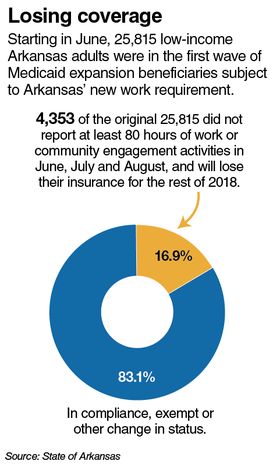 The 4,353 Arkansans losing coverage this month make up 16.9% of the people in the first group subject to the requirement, most of whom qualify for exemptions. But at that rate, 15,000 to 20,000 people in total will be dropped from Medicaid in 2018, said Kevin De Liban, an attorney with Legal Aid of Arkansas, which filed the suit challenging the Arkansas waiver along with the National Health Law Program and the Southern Poverty Law Center. And thousands more are likely to lose coverage next year when they become subject to the new rules. "Today's coverage loss numbers reinforce the need for and the basis of our lawsuit," De Liban said. He said most of the people who are losing coverage likely are exempt from the work requirement under state rules but got tripped up by the cumbersome reporting process, including the online-only portal. Critics say the state's online portal requires complicated processes including reference numbers and logins, has limited hours, is sometimes down for maintenance, and requires clicking through multiple screens. Beyond that, many low-income beneficiaries, particularly in rural areas, lack internet access. "We're talking about poor people," said David Wroten, executive vice president of the Arkansas Medical Society. "A lot of these people may not have internet access, or they may not have reliable mailing addresses. The state needs to get down on their level and find out what will work for that population. The primary goal is to get healthcare to those who need it." But Hutchinson stressed that the state is providing substantial assistance, including in-person assistance in county offices, to anyone who has limited internet access or who encounters other reporting challenges.